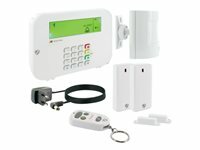 This wireless alarm system "Green Guard" from Schwaiger is used to secure property and houses. Different sensors allow for keeping an eye on or securing certain parts of a building, such as the entrance area. The whole system is controlled through the center unit, which communicates wirelessly with the different sensors. As soon as the center unit detects a violation via the sensors, an alarm is triggered.